It’s no surprise competing on Google Ads is growing costlier for e-commerce retailers. 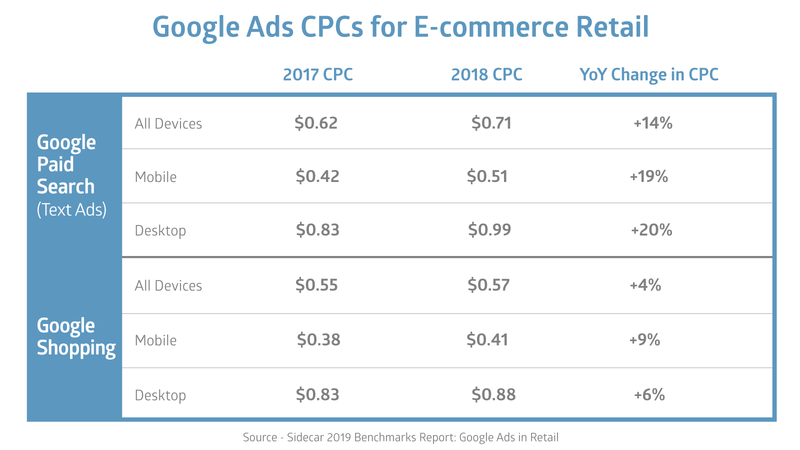 CPCs rose again in 2018, according to the latest data from Sidecar’s 2019 Benchmarks Report: Google Ads in Retail. Google Shopping CPC averaged $0.57 in 2018, up from $0.55 in 2017 (+4%). Google paid search (text ads) saw CPC grow even more, from $0.62 in 2017 to $0.71 in 2018 (+14%). This trend is nothing new. 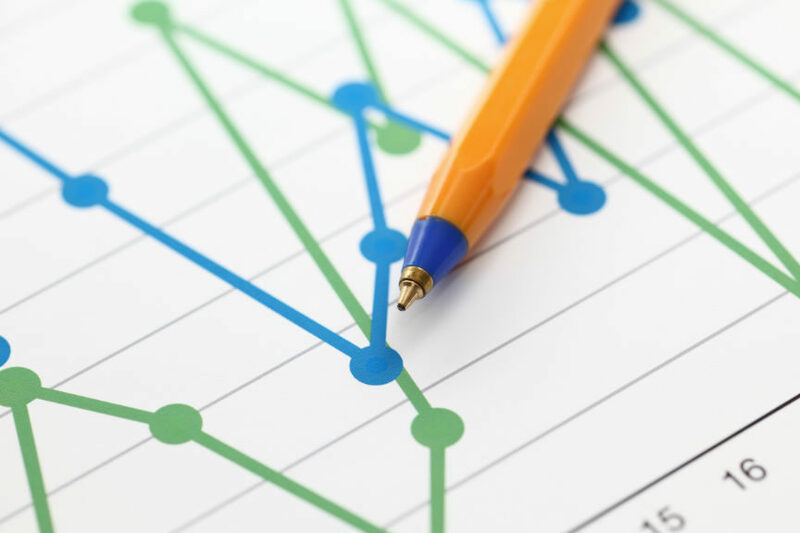 CPCs always rise year to year, and retailers generally spend more year to year to make up for the rising CPCs and to realize greater value as they test new tactics and reshape their strategies. To this end, retailers spent 24% more in Google Shopping and 17% more in paid search year over year in 2018. Amid rising costs, competing on Google Ads requires a big-picture view of your marketing funnel. Here’s why. Google Ads tends to excel as a direct response channel for e-commerce retailers. As such, it lives near the lower funnel. So let’s take a look at how conversion rates have changed recently. The conversion rate dipped by 1% YoY in Google paid search in 2018, and slid by 3% YoY in Google Shopping. We’re seeing a slight weakening, but not a tremendous amount of change. In fact, conversion rates have not moved much in the past few years. Paid search conversion rates nudged from 5.44% in 2016, to 5.48% in 2017, to 5.42% in 2018. 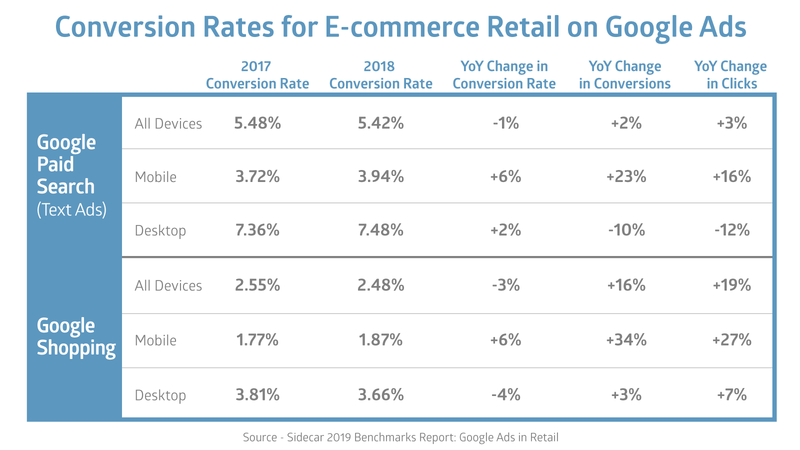 Similarly, Google Shopping conversion rates edged from 2.46% in 2016, to 2.55% in 2017, to 2.48% in 2018. 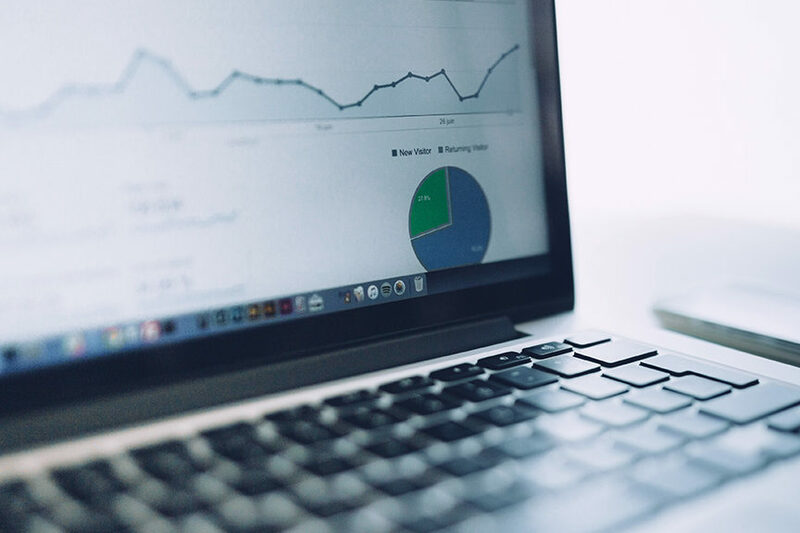 When cost and competition rise on direct response channels like Google Ads, retailers must determine how to infuse greater value into the top of their marketing funnel. This trend underscores why retailers must determine how to infuse greater value into the top of their marketing funnel to more aggressively compete on Google Ads. Lower funnel activities gain value when upper funnel activities gain value. 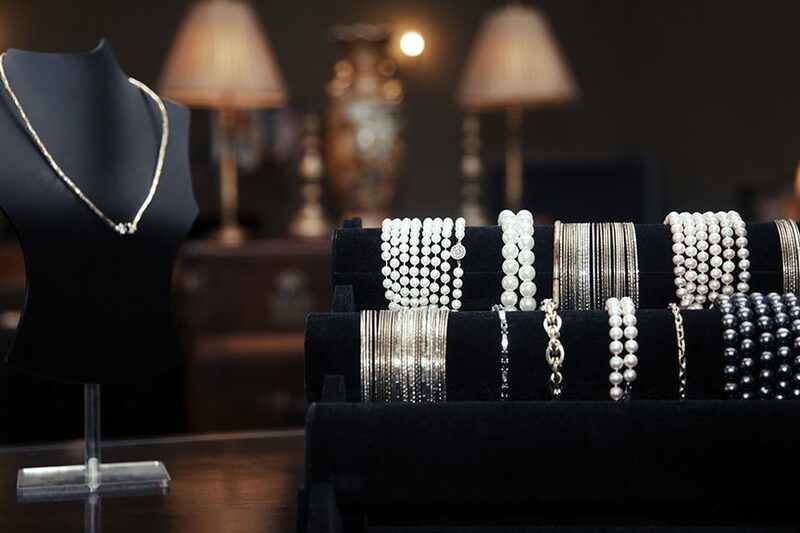 Social media (Facebook, Instagram, Pinterest) is among the key upper funnel activities retailers should optimize, coupled with testing Google’s Showcase Shopping ads and shoppable image ads. When it comes to Showcase Shopping in particular, we found increased activity on these ads during the 2018 holiday season. The discovery-driven ad format generated its highest percentage of total mobile Google Shopping clicks at 4.67% in October 2018, finds the 2019 Benchmarks Report. The only way to truly understand the value of the upper funnel is to measure it appropriately using a multi-channel attribution model that aligns with your customers’ shopping journey. We’ve talked in length about this imperative, and continue to see multi-channel attribution as a primary way e-commerce retailers will gain competitive edges in 2019. Start by understanding the main multi-channel attribution models. Then listen to our podcast with Kelli Patterson to hear her describe how she implemented a custom multi-channel attribution model at Moosejaw. Although conversion rates dipped for paid search and Shopping across devices, we see a different side to the story when we break down mobile versus desktop performance. Paid search ads on mobile converted 6% better in 2018 than in 2017. Additionally, conversion rate for paid search ads on desktop remained strong for the retail industry, averaging 7.48% in 2018, up from 7.36% in 2017. Within paid search, conversion rate improved on mobile and desktop, each. But a greater share of total conversions came from mobile in 2018 (42%, versus 35% in 2017). Because mobile has a lower conversion rate than desktop, the total conversion rate decreased. However, retailers will likely see total conversion rate start to grow again in the coming years when mobile conversion rate strengthens. Just like paid search ads, Shopping ads also converted 6% better on mobile in 2018, reaching 1.87%. However, desktop Shopping ads converted at 3.66%, a drop of 4% YoY, because traffic grew faster than conversions. Even though mobile still has quite a bit of catching up to do to reach desktop conversion rate, mobile is the device with the greatest upside. Competing on Google Ads requires operating with an updated mobile strategy. As mobile continues to gain dominance in terms of traffic, retailers will be paying increased attention to how CPCs change. A major question on the horizon is, When will mobile become the more expensive device? And what does that mean for Google Ads budgets and strategies? A cohesive approach to Google Ads is critical. Google paid search and shopping ads each have their strong suits for retail. Marketers must define how they leverage those strong suits to meet their goals. For instance, Google Shopping ads attracted 2.6 times more traffic than paid search ads did in 2018. Google Shopping CPC ($0.57) remained lower than paid search CPC ($0.71). And Google Shopping delivered 20% more conversions than paid search ads. However, traffic clicked through Google paid search ads at a better rate (2.40% CTR) than Shopping ads (0.99% CTR). Traffic also converted over twice as well on paid search (5.42% CVR) than Shopping (2.48% CVR). Google paid search also delivered 42% more revenue per click than Shopping ads. These performance benchmarks only start to show the relationship between Shopping ads and paid search ads. Within these averages, marketers know every business is different. Paid search and shopping campaigns can each play a number of roles—new customer acquisition, customer retention, brand exposure, and others—depending on a retailer’s goals, product catalog, and competitive environment. As Google continues to release new competitive metrics, like the KPIs replacing average position, marketers will gain a more accurate picture of where their ads are showing and for what queries. Competing on Google Ads in 2019 is about using intel like this to continue to understand where customers like to research product categories, versus learn about specific items, versus buy those items. 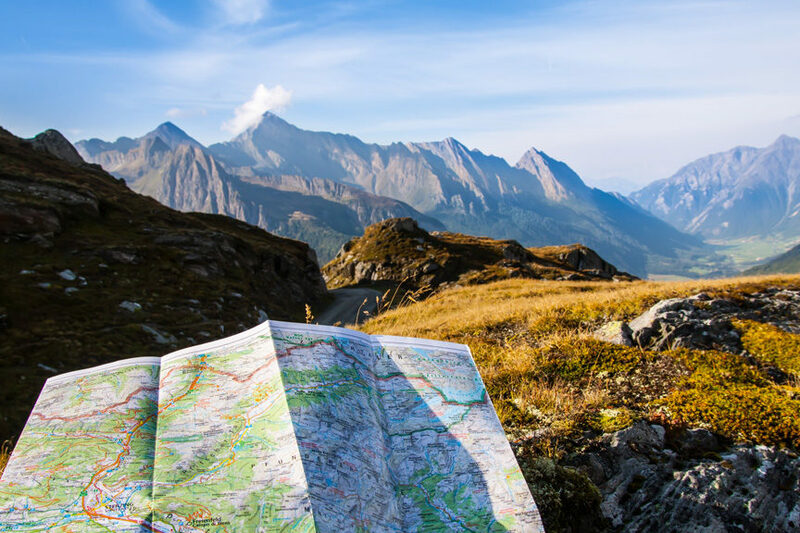 This is powerful information that lets marketers optimize their campaigns according to their customers’ acquisition paths. Interested in more insights? Pick up where this discussion leaves off by reading the 2019 Benchmarks Report: Google Ads in Retail. The report covers more recommendations from Sidecar’s performance marketing experts to empower retailers to drive Google Ads growth in 2019.